Key FeaturesBuild an enterprise application throughout the book that communicates with a microservicDefine and inject dependencies into your objects using the IoC containerMake use of Spring’s reactive features including tools and implement a reactive Spring MVC applicationBook DescriptionSpring is the most widely used framework for Java programming and with its latest update to 5.0 rolling out early next year, the framework is undergoing massive changes. 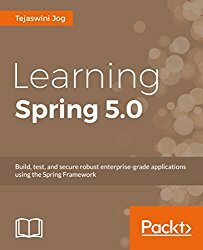 Built to work with both Java 8 and Java 9, Spring 5.0 promises to simplify the way developers write code, while still being able to create robust, enterprise applications.If you want to learn how to get around the Spring framework and use it to build your own amazing applications, then this book is for you.Beginning with an introduction to Spring and setting up the environment, the book will teach you in detail about the Bean life cycle and help you discover the power of wiring for dependency injection. Gradually, you will learn the core elements of Aspect-Oriented Programming and how to work with Spring MVC and then understand how to link to the database and persist data configuring ORM, using Hibernate.You will then learn how to secure and test your applications using the Spring-test and Spring-Security modules. At the end, you will enhance your development skills by getting to grips with the integration of RESTful APIs, building microservices, and doing reactive programming using Spring, as well as messaging with WebSocket and STOMP.What you will learnGet to know the basics of Spring development and gain fundamental knowledge about why and where to use Spring FrameworkExplore the power of Beans using Dependency Injection, wiring, and Spring Expression LanguageImplement and integrate a persistent layer in your application and also integrate an ORM such as HibernateUnderstand how to manage cross-cutting with logging mechanism, transaction management, and more using Aspect-oriented programmingExplore Spring MVC and know how to handle requesting data and presenting the response back to the userUnderstand the integration of RESTful APIs and Messaging with WebSocket and STOMPUnderstand Reactive Programming using Spring MVC to handle non-blocking streamsAbout the AuthorTejaswini Jog is a Senior Freelance Java Corporate Trainer. Specialized in J2EE architecture, she is a well-known trainer for leading MNC companies. Over last 5+ years in her corporate training experience, she had conducted more than 70+ training sessions on Java and J2EE.Certified in SCJP (Sun Certified Java Professional), her focus is on training students about the advanced technologies that can enhance their professional skills. She had trained more than 2000 professionals to date. She is a frequent speaker at different colleges and universities and has conducted sessions on “New Trends in Java”. Tejaswini also works with some organizations as a consultant to set up the training modules for developers to develop a skilled workforce.Recently, she had also written a book entitled Learning Modular Java Programming, which is mainly focused on developing modular applications using Java and Spring framework.You can find her on LinkedIn at https://in.linkedin.com/in/tejaswini-jog-52b5484a.